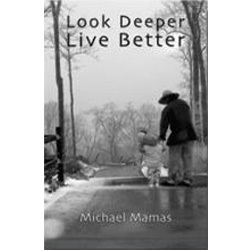 Look Deeper Live Better beautifully and concisely presents the spirit of Michael Mamas' teachings. Look Deeper Live Better is a collection of meaningful short sayings written by Michael Mamas with poignant black and white photographs. It provokes contemplation by taking us beyond the world that is familiar. Nevertheless, the concepts go right to the heart of what we already know is true, but haven’t been able to verbalize. Each page reveals truths about how life and existence works and can be revisited for continual insight. Other books don’t take us beyond our world; they help us rearrange our world. Look Deeper Live Better creates a feeling that takes us beyond the world we know. It expands awareness with each conscious reflection.